Americans have become wildly obsessed with eating chickens. In 1970 Americans ate 27.4 pounds of chicken per year, per capita. By 2007 (the latest year for which the stats are available), that number had more than tripled, to almost 91 pounds per year. This extraordinary increase in demand for chicken meat was driven, in large part, by McDonalds’ introduction of “chicken nuggets” onto its menu. Today over 42% of chicken is sold through food service outlets, and 60% of that is sold by fast food restaurants. Obviously this has resulted in a astronomical increase in the amount of chickens raised for slaughter in America. In the last 60 years that number has skyrocketed an incredible 1,400%, from about 580 million in the 1950s to an estimated 9 billion today. Of course the vast majority of these birds are raised in high-intensity confined animal feeding operations. Most are raised in facilities housing 600,000 or more chickens. Without a doubt, chickens are the most tortured and abused animal on the planet. Whereas chickens were almost always present on American farms in the past, today they rarely are. In 1900, there were chickens on 95% of American farms. By 1950 that number had declined to 78%. Today, less than 1% of the farms in America have chickens. The number of farms producing chickens has fallen 98% in the last 60 years, from over 1.6 million in the 1950s to a mere 27,000 today. Traditional farmers wouldn’t recognize the way chickens are raised for slaughter today. Chickens were an important part of a traditional diversified family farm. Historically chickens were raised as they are on our farm. Chickens were kept primarily for their eggs. Those which were eaten were the young roosters, which were called “fryers,” and the old hens who had quit or greatly reduced their laying, which were called “stew hens.” The favored breeds on family farms were what are now called dual-purpose breeds–chickens kept as layers, which were also large enough to eat. The concept of “broilers” was largely unknown. A normal chicken takes 12-16 weeks to reach full maturity. Slaughtered at that age, the bird will weigh 7-8 pounds. In order to maximize profits and satisfy the American demand for chicken meat, the favored animal of the chicken industry is a mutant breed called “Cornish Cross.” These birds are genetically engineered to grow rapidly and to produce a large white breast which the American public has come to prefer. It is a bland meat, lacking the authentic flavor of a natural chicken, but the breasts are huge and white and Americans can’t get enough of them. These creatures are sad testimonies to American gluttony and their disconnection from real food. They have been engineered to eat constantly and grow quickly. A Cornish Cross “broiler” weighs an astonishing 5 pounds or more at only 5 weeks old. These birds cannot reproduce and they must be butchered, since they can’t survive naturally. Their frames aren’t able to carry their weight, and the animals will become unable to walk and will die of heart attacks after only a few more weeks if not slaughtered. They’re not anatomically capable of living long enough to lay an egg. 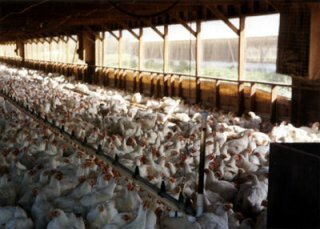 At least one third of these birds are suffering from respiratory or digestive failures by the time they’re slaughtered. They are unhealthy animals being fed to unhealthy people. I wish I could say that these unnatural practices occur only on industrial farms. But sadly, that is not true. Even supposed “sustainable” farms raise these animals–buying the chicks from commercial hatcheries. Many farms put Cornish Cross “broilers” in pens, which are dragged around pastures for a few weeks before the birds are butchered. These animals are sold as “pasture raised,” and bought by folks thinking they’re getting naturally raised chickens. While this practice is marginally better than what happens in the CAFOs, the raising of this type of animal is inherently cruel and there is nothing “sustainable” or “natural” about it. On this farm we raise real chickens. They grow at a natural rate. They live long healthy lives and are capable of hatching chicks. When we end up with unwanted young roosters, we slaughter them as humanely as possible and we eat them with a good conscience. We tend chickens the way family farmers have done for thousands of years. We prefer it this way.